The theme for Boulder Dash is choice. And for the $5 that this retro diamond collection game from Chillingo costs, we found a great deal of choices available. Let’s start with three different control modes, including two multi-touch arcade styles. Surprisingly, we found that the traditional arcade controls were better suited to the game, as touching “Rockford,” the game’s character, to move him frequently obscured the screen. Choose from the retro graphics of the original 1984 release of the game, or more modern graphics created specifically for the iPhone. We found the retro look, though nostalgic, a bit too difficult for play. You can even switch between portrait and landscape view in the middle of play. 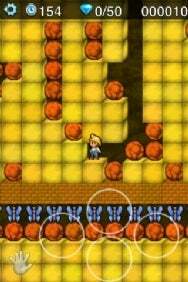 Eighty scrolling caves with five difficulty levels to choose from make for many hours of play. You can even decide within certain limits which caves to start in. You must guide “Rockford” as he digs through caves collecting the required number of diamonds to open the exit within the time limit, avoiding enemies and falling rocks. He faces the constant danger of being crushed or trapped by an avalanche, or killed by an underground explosion. High scores are recorded on the Feint Network, the Chillingo social network. You can even set your account up with your twitter or Facebook accounts, though we consistently got errors with Twitter. There are chat rooms to talk with other Boulder Dash players; make sure to scroll up to see previous chats. Boulder Dash is compatible with any iPhone or iPod touch running the iPhone 2.2.1 software update.